Allergies occur when the body's defence system (immune system) overreacts to certain substances. The immune system treats a harmless substance as if it is a harmful germ or virus. Many things can cause this overreaction, including pollens, medicine, food, dust, animal dander, and mould. Allergies can be mild or severe. Mild allergies can be managed with home treatment. But medicine may be needed to prevent problems. Managing your child's allergies is an important part of helping your child stay healthy. Your doctor may suggest that your child get allergy testing to help find out what is causing the allergies. When you know what things trigger your child's symptoms, you can help your child avoid them. This can prevent allergy symptoms, asthma, and other health problems. For severe allergies that cause reactions that affect your child's whole body (anaphylactic reactions), your child's doctor may prescribe a shot of epinephrine for you and your child to carry in case your child has a severe reaction. Learn how to give your child the shot, and keep it with you at all times. Make sure it is not expired. If your child is old enough, teach him or her how to give the shot. Wash sheets, pillowcases, and other bedding in hot water every week. Use dust-proof covers for pillows, duvets, and mattresses. Avoid plastic covers, because they tear easily and do not "breathe." Wash as instructed on the label. Do not use any blankets and pillows that your child does not need. Use blankets that you can wash in your washing machine. Consider removing drapes and carpets, which attract and hold dust, from your child's bedroom. Limit the number of stuffed animals and other toys on your child's bed and in the bedroom. They hold dust. If your child is allergic to house dust and mites, do not use home humidifiers. Your doctor can suggest ways you can control dust and mites. Look for signs of cockroaches. Cockroaches cause allergic reactions. Use cockroach baits to get rid of them. Then clean your home well. Cockroaches like areas where grocery bags, newspapers, empty bottles, or cardboard boxes are stored. Do not keep these inside your home, and keep trash and food containers sealed. Seal off any spots where cockroaches might enter your home. If your child is allergic to mould, get rid of furniture, rugs, and drapes that smell musty. Check for mould in the washroom. If your child is allergic to outdoor pollen or mould spores, use air-conditioning. Change or clean all filters every month. Keep windows closed. 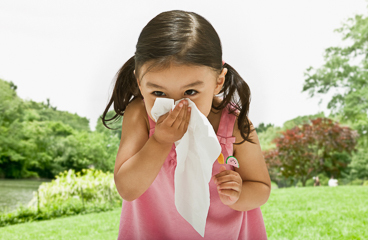 If your child is allergic to pollen, have him or her stay inside when pollen counts are high. Use a vacuum cleaner with a HEPA filter or a double-thickness filter at least 2 times each week. Keep your child indoors when air pollution is bad. Have your child avoid paint fumes, perfumes, and other strong odours, and avoid any conditions that make the allergies worse. Help your child stay away from smoke. Do not smoke or let anyone else smoke in your house. Do not use fireplaces or wood-burning stoves. If your child is allergic to your pets, change the air filter in your furnace every month. Use high-efficiency filters. If your child is allergic to pet dander, keep pets outside or out of your child's bedroom. Old carpet and cloth furniture can hold a lot of animal dander. You may need to replace them. You think your child is having a severe allergic reaction. Your child has symptoms in more than one body area, such as mild nausea and an itchy mouth. After giving an epinephrine shot call 911, even if your child feels better. Sudden raised, red areas (hives) all over his or her body. Passing out (losing consciousness). Or your child may feel very light-headed or suddenly feel weak, confused, or restless. Your child has been given an epinephrine shot, even if your child feels better. Your child does not get better as expected. Enter M286 in the search box to learn more about "Allergies in Children: Care Instructions".